Of all the new hop-forward guest beers brewed by Moorhouse’s in 2018, only one sold out in a week and managed in that time to pick up a gong at the SIBA beer festival in October. That beer was Scaredy Cat, a 4.3% session IPA that is about to return to bars as our latest permanent beer alongside regional favourites White Witch and Blonde Witch. It is a pale, easy-drinking session IPA that is dry hopped with the incredibly popular Mosaic and Amarillo hops to give citrus orange and pineapple flavours, and tropical mango on the nose. The beer was launched at the Wharf, Castlefield event on 23 January 2019, where attendees were able to taste the new ale. This event is held annually by Moorhouse’s before the Manchester Beer and Cider Festival at the Manchester Central Convention Complex, inviting both customers and suppliers. 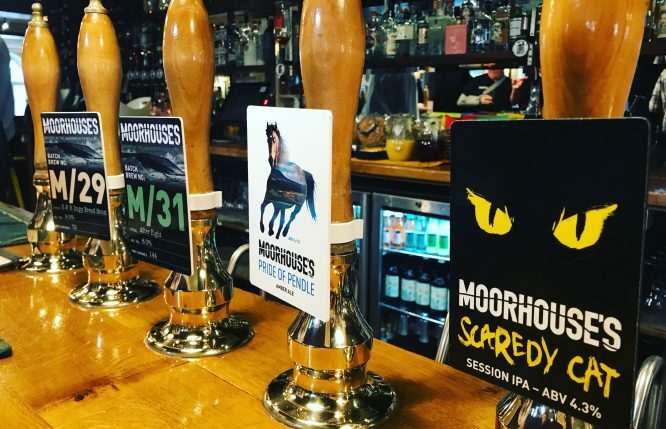 Alongside Scaredy Cat, Moorhouse’s Brewery is supplying the Wharf with four limited edition beers produced in its pilot brewery. These beers see the shift towards exciting new styles, including a Black Strawberry Milkshake IPA 5.2%, which sees Moorhouse’s Brewery experimenting with new beer styles, hop varieties, and ingredients. On the launch of Scaredy Cat, Moorhouse’s Brewery managing director Lee Williams, commented: “If you’re going to be late to a party, then make sure you make an entrance and we know with Scaredy Cat we’re certainly going to do that. Hats off to the brewing team, we’re confident that we’re onto another winner here as Scaredy Cat will perfectly complement our other beers not replace them”. The new 2019 beer follows a transformative 2018 for Moorhouse’s Brewery as it launched a series of new hop-forward keg beers, unveiled a new look for its much-loved cask beers, as well as a total rebrand, all aimed at broadening its appeal to a wider audience.